Remington: A cut above the rest? As Peter O’Neill’s political career reached its crowning peak in 2011, his business empire underwent an astonishing period of growth. O’Neill’s private business interests expanded to include oil and gas industry and mining support services and construction, an airline, insurance, finance and banking, consumer lending, information technology, funeral services, hospitality and gambling, travel and tourism, and consultancy services. There is nothing necessarily sinister about this. But in a national economy where the state is a major investor and consumer – funded in part through foreign borrowings – having a Prime Minister personally possessing significant stakes in key markets, generates fertile ground for conflicts of interest. place himself in a position in which he has or could have a conflict of interests or might be compromised when discharging his public or official duties … or diminish respect for and confidence in the integrity of government in Papua New Guinea. There is no single contract given to any associated companies that I have a shareholder of or any Minister of this Government has got a shareholding. There is absolutely nothing since the State has taken over. We understand conflicts of interest very well. In this instalment of The Midas Touch, PNGi puts O’Neill’s statement to the test. Having mapped the Prime Minister’s business empire, through a convoluted web of companies which he has an explicit stake in – this doesn’t account for corporate holdings held on trust for O’Neill – PNGi has uncovered evidence that his businesses have directly benefited from government contracts, in addition to contracts awarded by international financial institutions and foreign governments. O’Neill’s business Wild Cat Developments was one of the first to benefit from the construction of the controversial new Western Pacific University, in the Prime Minister’s Pangia-Ialibu electorate. 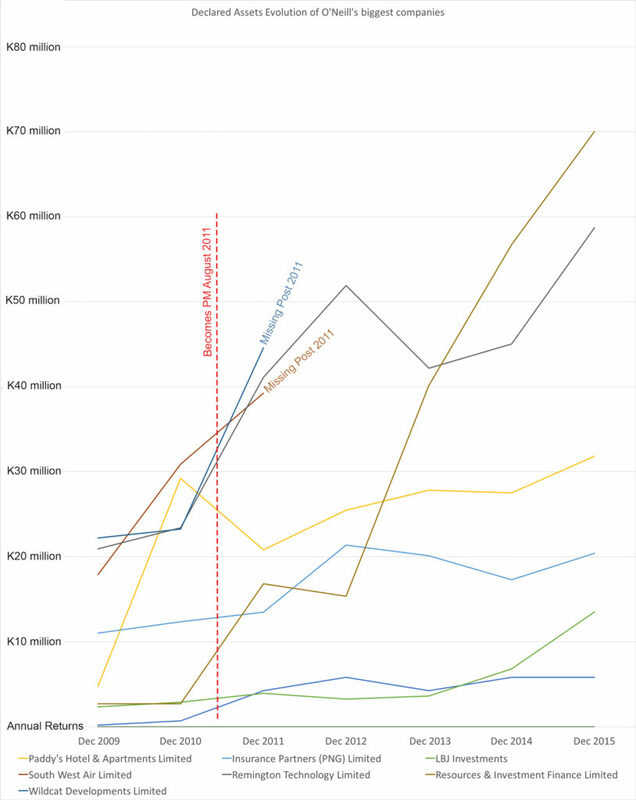 It has also made significant revenues from Asian Development Bank funded projects. Remington Technology, another company in which the Prime Minister has a substantial stake, has benefited from contracts with state entities, government departments, and AusAid. PNGi also found O’Neill owned entities have breached reporting requirements set out in the Company Act 1997. Has Peter O’Neill declared his interests to the Ombudsman Commission and sought special dispensation for his voluminous range of business interests? Did Peter O’Neill recuse himself from any National Executive Council (NEC) decision, which his companies would benefit from, directly or indirectly? Have these contracts complied with the governance protocols of the relevant International Financial Institutions and foreign government agencies? In light of the serious concerns raised by the Constitution’s framers over corruption – namely, a person cannot serve two masters – which history has bore out with striking examples and evidence, is it right for senior political figures to retain large business holdings? Should the Prime Minister be able to personally profit from decisions made by his government, even where he has recused himself from the decision making process, and declared his assets to the Ombudsman Commission? We don’t make hundreds of millions kina in profit but we continue to maintain those companies because we continue to support Papua New Guinean families so, Mr Speaker, that is the case on the issue as it is. 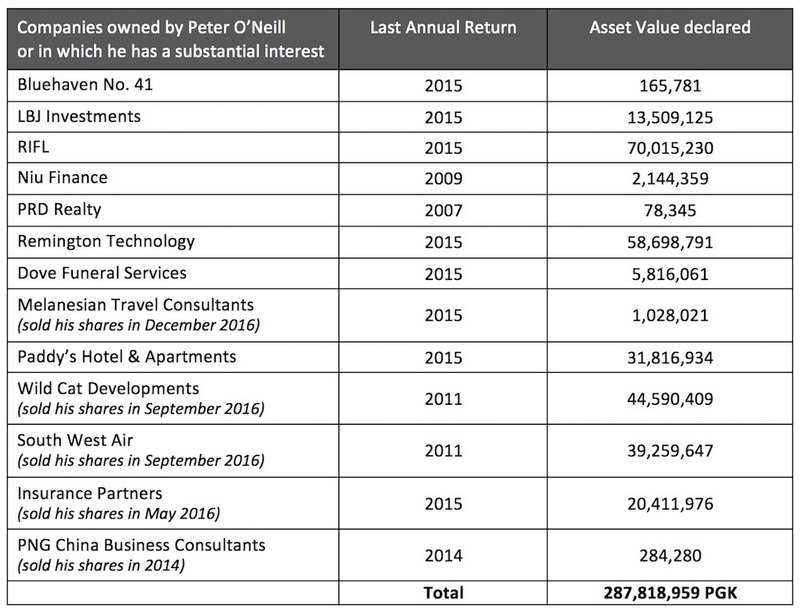 The evidence presented here, indicates the opposite – Peter O’Neill is generating considerable returns from his vast business holdings, which have sizeable declared assets. All this in a country where the legal minimum wage remains 3.5 kina an hour, and income inequality is the highest across the entire Asia-Pacific region. We will now chart O’Neill’s considerable business success over the past decade, looking at the complex governance issues it has raised, as the Member for Ialibu-Pangia seized the highest political office in Papua New Guinea. Following his return to office in 2007, and appointment first as Minister for Public Services, before taking over as Prime Minister in 2011, O’Neill’s business relationship with the prominent business couple, Sir Luciano Cragnolini and Lady Ni Yumei Cragnolini, blossomed. The Cragnolinis are construction industry heavyweights, through the L&A group of companies. 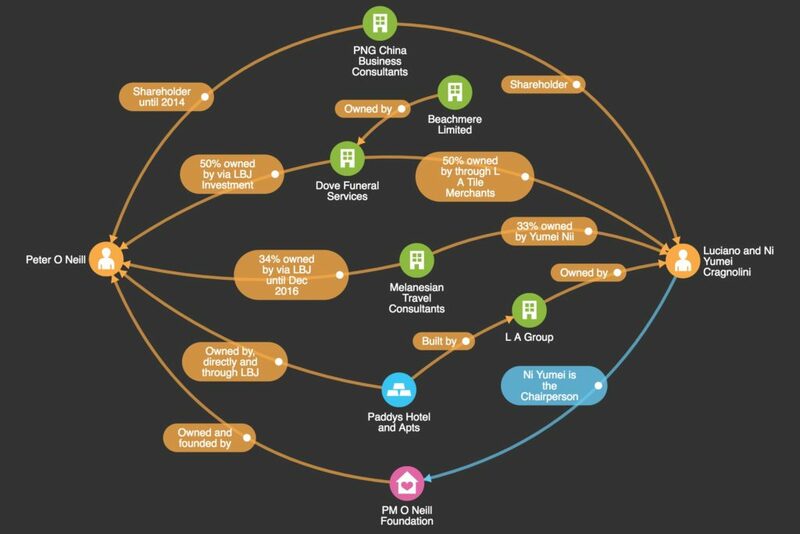 In 2008, Peter O’Neill was issued a minority 10% stake in the company PNG China Business Consultants Limited, alongside Sing Yun Ling from Hong Kong and Ni Yumei Cragnolini. This company specialises in wholesale trade and consulting. During 2010, Peter O’Neill (through Remington Technology and then LBJ Investments) acquired a 34% stake from Ni Cragnolini in another Cragnolini business, Melanesian Travel Consultants Limited. This reduced Ni Yumei Cragnolini’s shares to 33%, while the remaining 33% was held by the Chinese, Yuewei Ni, who had the same registered address as Ni Yumei. In May 2009, Peter O’Neill acquired a 50% interest in Dove Funeral Services Limited (then called Vixen No. 88 Limited), through LBJ Investments. O’Neill’s business partner, and the other major shareholder (50%) in this entity is L&A Tile Merchants Ltd, a company jointly owned by Sir Luciano Cragnolini and Lady Ni Yumei Cragnolini. A minority shareholding was held for a period by the Australian general manager of Dove Funeral Services, Kevin John Bender (Bender later transferred his 10% share equally to L&A Tiles and LBJ Investments). Ni Yumei was made Chairperson of the Prime Minister’s Foundation in 2013. The O’Neill-Cragnolini joint-venture, Dove Funeral Services Limited, has attracted notable public attention. For example, as the funeral business was about to be constructed in Taurama during 2011, landowner groups alleged the land had been acquired through fraudulent means and was sold illegally to two prominent Port Moresby businessmen, ‘without the knowledge of the traditional landowners’. The news report does not mention the businessmen’s names. The following year, local media attended Dove Funeral Services’ launch. Prime Minister O’Neill was present to cut the ribbon. According to The National he ‘congratulated the management and staff of L&A Group of companies for the launch of their new business’. From the news reporting, it appears, that Peter O’Neill notably failed to disclose his own beneficial interest in the venture. If these media reports are an accurate version of events, certain questions emerge. Is this the first and only occasion in which the Prime Minister has patronised a business, drawing on his political office, without disclosing a potential conflict of interest? Or does the Dove Funeral Services launch signal a wider pattern of conduct? Dove’s controversial footprint does not end there. The following year, the company generated macabre headlines when claims were made that it had burnt up to 100 unclaimed bodies, ‘including dead babies, from Port Moresby General hospital’s morgue in an open pit,’ leaving unbearable smell and fumes in the surrounding neighborhood, and the police contemplating legal action. Dove Funeral Services also registered a subsidiary in 2012, Beachmere Limited. There are few details available on the company at the Investment Promotion Authority website. We only know that the registration was enacted by Jeffery Leonard Shepherd, a New Zealand national and partner at Ashurst lawyers, who was sworn in as a National and Supreme Court judge in early 2017. In addition to direct collaboration through jointly owned ventures, it appears O’Neill companies and the L&A group have also teamed up in other ways. For example, shortly before O’Neill was made Treasurer, both L&A Construction Ltd and O’Neill’s Remington Technology were contracted to renovate the National Parliament. L&A Construction Ltd was hired to lay marble and granite tiles, while Remington Technology supplied and installed new scanners. At that time, the Speaker of Parliament, Jeffery Nape, explained that he will be ‘seeking funds from the Department of Finance for this much-needed work.’ The contracted value for L&A’s parliamentary renovations, is estimated at K23 million, according to the Oxford Business Group. The value of Remington’s contract is not known – public procurement is not transparently recorded in Papua New Guinea. While there was notable silence about an O’Neill company, obtaining a lucrative government contract, L&A renovations did attract condemnation following the destruction and removal of 19 masks and a totem pole from the parliament, which led to successive court cases that found the actions both unlawful and unconstitutional. Finally, O’Neill and the Cragnolinis again teamed up for the construction of the O’Neill owned Paddy’s Hotel and Apartment complex. According to information published on the L&A website, it was the Cragnolinis’ L&A Construction Ltd that was hired by Pangia Enterprises Limited to build the hotel, restaurants, bar and office. PNG China Business Consultants Limited, Notice of Issue of Shares, Investment promotion Authority. PNG China Business Consultants Limited, Annual Return 2008, Investment promotion Authority. Melanesian Travel Consultants, Annual Return 2009 and Notices of change of shareholder lodged with IPA on 21 September 2010, Investment Promotion Authority. O’Neill first bought Vixen No.88 by purchasing the existing 2 shares through his company LBJ from the original owners and then issued a further 98 shares, 43 to LBJ, 45 to L&A and 10 to Kevin Bender. Vixen No. 72 Limited, Notice of issue of shares, Investment Promotion Authority. Dove Funeral Services Limited, Notice of change of shareholder, Investment Promotion Authority. Joku, H. (2011), ‘New funeral home caught in land row,’ PNG Post Courier, August 10 2011. Blancheview Limited (former name of Beachmere Limited), Application for the registration of a company, dated 02 February 2012 and signed by Jeffery Leonard Shepherd, Investment Promotion Authority; Blancheview Limited (in the course of changing its name to Beachmere Limited), notice of transfer of shares dated 22 May 2012, Investment Promotion Authority. Remington Technology: A cut above the rest? As O’Neill’s public responsibilities increased during July 2010, with the Finance and Treasury portfolio, one of his flagship companies Remington Technology, was en route to become one of Papua New Guinea’s leading telecommunications firms. In the same month O’Neill was nominated Treasurer, the Border Development Authority – a state entity set up in 2009 – contracted Remington to install the “VSAT” satellite communications system around West Sepik province. Remington’s project partner was the Australian group, Orion Satellite Systems, a business which specialises in Australian government backed projects, having installed more than 2000 government funded systems in the past 3 years. The VSAT contract was criticised in the Papua New Guinea media by Belden Namah, who claimed Orion Satellite Systems lacked the necessary local experience. Its Australian managing director, Andrew Johnson, defended the deal, noting that Orion’s partner, Remington Technology, had solid experience as a leading provider of communication services across Papua New Guinea. Johnson claimed: ‘We base this view on the very rapid and successful implementation of the national PNG Treasury network of VSAT systems, [by Remington Technology] which gives us total confidence in Remington as a partner’. It was not mentioned in the media coverage, that Peter O’Neill had a beneficial interest in Remington Technology. However, it is not just state entities in Papua New Guinea, who have awarded contracts to Remington Technology. It can be revealed that the Australian Department of Immigration awarded a contract to Remington Technology during August 2014, while Peter O’Neill was Prime Minister. It appears that Remington Technology was given a contract worth AUD$ 54,433 for renting a property, being used for the Papua New Guinea Immigration Refugee Division Office Accommodation. The contract period was May 2014 to April 2017. No further details were provided on the arrangement. This is in fact one of two occasions, on the public record, where Remington Technology has been the beneficiary of an Australian government contract. In the months preceding Peter O’Neill’s accession to the Prime Ministership, AusAid purchased nearly AUD$ 47,780 worth of office equipment from the same Remington company, between April and June 2011. All of which must be set against the context emerging out of the Dove Funerals case. We observed in that instance, the Prime Minister used his office to support a business, it appears, without publicly declaring his interest, if the media reporting is an accurate record of the launch. In parliament O’Neill has also denied receiving contracts from state entities, in that case Ok Tedi. Yet it appears he has personally benefited from a contract awarded by another Papua New Guinea state entity, the Border Development Authority, through Remington Technology. By the Prime Minister’s own admission these are potential conflicts of interest. A clear account is needed of how these business deals have been managed, set against the constitutional and legal backdrop leaders must conform with. Questions also must be asked of the Australian government, and its due diligence process when awarding contracts. But as the next section indicates, this is the tip of the iceberg. PNG Post Courier, ‘Company hit back at MP’s allegation’ July 26 2010. Australian Contract Award: Remington Technology LTD awarded a contract worth $54,433.40, for Papua New Guinea Immigration Refugee Division Office Accommodation’ Premium Official News, 30 August 2014. ‘Purchase of Office Equipment (printers/photocopiers/scanners)’ TendersInfo – Contract Awards, 8 June 2011. In a corporate brochure published by Wild Cat Developments – one of PNG’s premiere civil works and construction firms – the company’s illustrious history is chartered: ‘From its beginnings in hydrometric survey work, the company has grown to become a major force in oil-heli-rig construction, general field support services to the mining and petroleum industries, road, bridge and airport construction and maintenance and general civil engineering works’. We are told its clients include ‘virtually every major oil company operating in PNG’. In early 2014,  Australian National Gregory Forbes Bill, sold Wild Cat Development Ltd (formerly Carson Pratt Services) to Peter O’Neill’s company, LBJ Investments Limited for an unknown amount. Wild Cat’s own literature suggests the sale actually took place in 2013. O’Neill himself claimed in 2014, Wild Cat was a company he had had a shareholding in ‘for many years’. Whatever the exact date of the purchase, O’Neill and Wild Cat enjoyed a fruitful relationship. In late 2016 O’Neill sold his Wild Cat shares to the Australian national, Sir Theophilus Constantinou, through the latter’s company Iaraguma Limited. Constantinou, whose family enjoys close ties to the Cragnolinis, is perhaps the wealthiest businessman in Papua New Guinea. In the two or three-year period, or perhaps more if the Prime Minister’s testimony is accurate, in which O’Neill owned Wild Cat Developments, the company was successfully fattened up for market – whether by design or not – with a large raft of construction contracts, funded by the Papua New Guinea Government and Asian Development Bank. Indeed, following its takeover by Peter O’Neill’s firm, Wild Cat claimed in 2016, it ‘thrived’. Wild Cat’s CEO, Tom Derby, acknowledges however, that Wild Cat has traditionally over-relied on direct government contracts for the majority of its infrastructure work. To diversify its portfolio and mitigate against sovereign risk, Derby argued in 2016, ‘Wild Cat Developments is pursuing work that is not directly or completely funded by the Government, for example, ADB, JICA, or World Bank Funded projects and/or privately funded projects. We are also working with foreign companies who have access to foreign soft loan facilities and who supply – for example – bridge structures and pavement stabilizing compounds’. While Wild Cat may be trying to diversify its customer base, its bread and butter has been large-scale road and bridge construction. Roads and infrastructure contracts issued by government and donors, have been something of a cash-cow for Papua New Guinea’s construction sector in recent years. For example, in 2016 the Department of Works recorded an unprecedented expenditure of K2.7 billion between 2013 and 2015 (out of a budget appropriation of K4.1 billion), which has been spent primarily on the maintenance and construction of roads. This road expenditure boom has been accompanied by the emergence of a new development model inside the Department, where major works are outsourced to the private sector – with the Department of Works acting as the oversight agency, including for donor agency funded projects. Under this new arrangement, smaller contracts are ring-fenced for local companies, while larger awards are open to international bidding, with a caveat. ‘Projects with a value below K20 million are being given to local contractors. Anything above K50 million will have to include 40% to 50% local participation,’ the Works Secretary, David Wereh, is reported to have said at a Brisbane Investment summit. In a bulletin aired on EMTV during April 2013, Peter O’Neill is reported to have inspected construction work performed through an allocation from his own DSIP fund (District Services Improvement Program), in the electorate of Ialibu-Pangia. Roads inspected by the Prime Minister included, Wiru Loop, East Pangia, Ialibu-Kagua, and Pangia and Ialibu station. 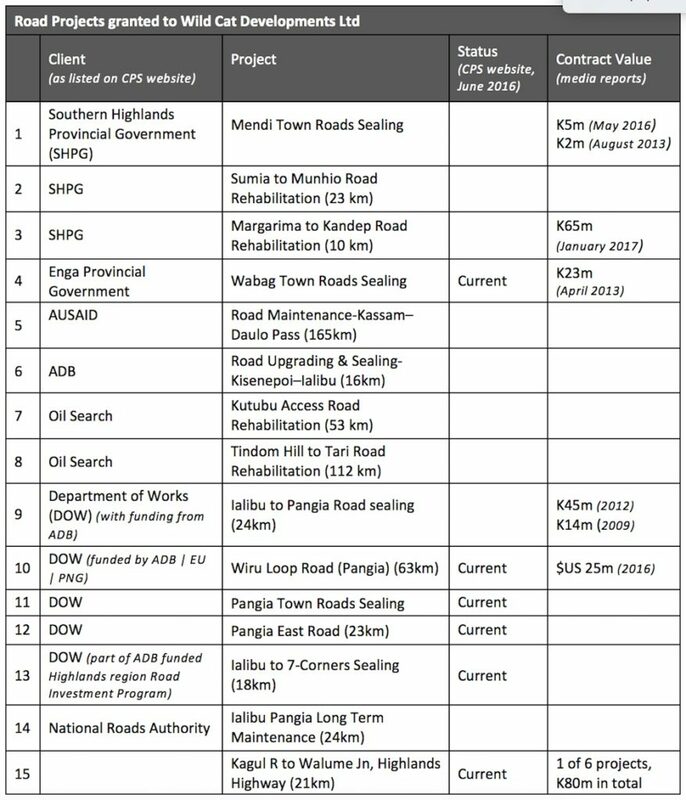 All of these roads are listed as work conducted by Wild Cat Developments, although the company does not provide the relevant dates. It is unclear how much, if at all, Wild Cat Developments was paid from the DSIP – this information is not made publicly available. Also, given the contradictory reports on the date in which O’Neill’s company acquired Wild Cat Developments, it is also unclear if a potential allocation from DSIP was made to Wild Cat Developments when O’Neill had a beneficial interest in the construction firm. During 2013, eyebrows were raised when the Prime Minister announced plans to build the new Western Pacific University in his own Pangia-Ialibu electorate. The plan generated considerable kickback, owing in part to the gross under-funding of Papua New Guinea’s existing higher education institutions, the high levels of unemployment among graduates, and the fact Ialibu is remote and relatively inaccessible, being located halfway between the towns of Mendi and Mount Hagen, 15km off the main Highlands Highway and without its own airport. Nevertheless, the plan was endorsed by the National Executive Council in April 2015 (NEC Decision No. 299/2013), with K42 million allocated for the first phase of the construction. In an announcement dated 26 June 2016, the Western Pacific University noted one of the first contracts awarded from its budgetary allocation, is ‘a Subcontract Deed with the WildCat Developments Company for clearing, lay down area, access roads and drainage works’. It would appear that not only is a new University being built in the Prime Minister’s electorate, without a compelling business case, one of the first beneficiaries of the construction work is a firm, ultimately owned at the time of the award, by the Prime Minister’s company LBJ Investments. In late 2013, a contract worth K10.4 million was awarded to Wild Cat Development to build a 164 meter footbridge over the Ok Tedi River, with money coming from the Western Province people’s dividend trust fund. This fund is held by the Department of Mineral Policy and Geohazard Management, on behalf of local stakeholders under the Community Mine Continuation Agreement (CMCA). The Ok Tedi Foundation facilitates project procurement. In December 2014, Wild Cat Developments, working alongside the Australian company Golding PNG Limited, formed a joint venture, Wildcat Goldings Joint Venture (WGJJ). WGJJ was awarded a US$ 32.86 million contract (PGK K85m) from the Asian Development Bank (ADB) to build 12 bridges along the New Britain highway in West New Britain. They were responding to an ADB tender that was open between February and the end of March 2014. The late Governor-General Sir Michael Ogio signed the contract on behalf of the state, while the governor of West New Britain, Sasindran Muthuvel and the ADB country director Marcelo Minc attended the ceremony. This was the single largest contract awarded from the US$ 100 million loan procurement facility established in 2011 between the Papua New Guinea Government and the ADB, on its ‘bridge replacement for improved rural access’ program. One of the ‘current’ projects listed on Construction and Procurement Services Ltd website – the new name for Wild Cat Developments – is civil works being conducted on the Highlands Highway from Kagul Road to Walume Junction. The project summary does not state which department the contract was obtained from. However, the last publicly available issue of the Works Department’s quarterly report magazine, dated August 2014, suggests that this road project is part of an K80m allocation, for six different projects, from which six contracts have been awarded, at a total cost of K51.04 million to taxpayers. The recipient companies have not been published. Nevertheless, the Linkedin profile of Teddy Auro, a Wildcat Developments project site engineer, who previously worked as an engineer for the Department of Works and Implementation in Mendi, lists the project as having taken place between September 2015 and June 2016, under the Highlands Highway Redevelopment Program. Another ‘current’ contract listed on the Construction and Procurement Services’ website is the Department of Works, ‘Ialibu to 7 corners’ road sealing (18km). The National recorded in September 2013 that the road was in the process of being sealed. A March 2014 issue of PNG Today highlighted that 85% of the work had been completed. The 2017 national budget indicates that the Ialibu to Kagua Road is part of Tranche 2 projects, which also includes the Mendi to Tambul road and the Kotna to Lampram road. It says that contracts were awarded in July 2015, with a combined price of K300 million kina. 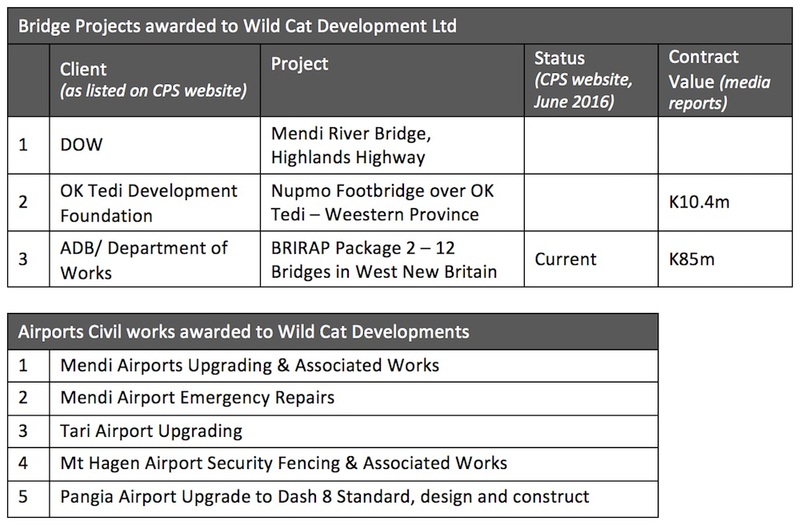 Once again, it is unclear if Wild Cat Developments was hired in 2013 to seal the road, or if it is currently taking part in a new ADB financed project in the area, as its website seems to indicate. Construction and Procurement Services also points to 10km of re-habilitation work it completed on the Margarima to Kandep road, for the Southern Highlands Provincial Government. The website does not state the time period in which the project was completed. However, a January 2017 report from The National states that the K65 million kina Margarima-Kandep Road project was launched by the Minister for Works Francis Awesa, the Finance Minister James Marape, the works secretary David Wereh and the Kandep MP Don Poyle in 2014. However, as of 2017, it has evidently not been implemented, leaving local people questioning what happened to the rehabilitation programme. Finally, Construction and Procurement Services lists work done at the Mendi, Tari, Mt Hagen and Pangia airports, without adding any details on the dates of completion. It is worth noting that the ADB has been supporting airport renovations around the country, to the tune of K2.2 billion, as part of the Civil Aviation Development Investment Program, which is due to complete in 2018. Under the arrangement, work such as airport fencing and emergency response capability, for instance, have been financed and completed under the scheme at the K70m Mendi Airport, which corresponds to the type of work listed on the Construction and Procurement Services website, at the same airport. The company also states that it is currently working on the upgrading of the Pangia airport, which is similarly financed by the ADB. It is also worth examining other contracts and interests enjoyed by companies that O’Neill has held a stake in, while Prime Minister. Again, their operations are closely entwined with state power and taxpayer funds. Montina Limited, Particulars of Annual Returns filed with IPA on 10 May 2016, Investment Promotion Authority; Note: Christina Josephine Constantinou became Christina Josephine Cragnolini indicating a potential marriage. ‘Bridging the Ok Tedi River 164m footbridge bring Christmas Joy,’ PNG Post Courier, 24 December 2013. Wildcat Golding Joint Venture, Application for Registration of Business Name, 5 December 2014, Investment Promotion Authority, and Wildcat Golding Joint Venture, Business Name extract as at 1 March 2017, Investment Promotion Authority. ‘Mount Hagen Airport Opens After ADB-Supported Upgrade’ 26 November 2015, Asian Development Bank, accessed on 27 April 2017 and Setepano, N. (2016), ‘Airport upgrade cost at total K2.2 billion,’ PNG Post-Courier, 22 February 2016. One profitable concern acquired by O’Neill, is the little-known insurance broker, Insurance Partners (PNG) Limited. A probe into the company’s website, returns scant detail about its recent activities; its website simply indicates that since the company’s establishment in 2004, it has become the ‘leading insurance broker in the country’. While Peter O’Neill’s accountant, Joseph Kup, was a shareholder in the business since its inception, Peter O’Neill acquired a direct stake in the company after LBJ Investment Ltd purchased 407,000 shares from Jason Siew Ann Tan and Barry James Tan, for an undisclosed amount in June 2014. As a result, O’Neill held 37% of the company, while Kup possessed a 16% stake. Other shareholders were Fairhaven No.72 (owned by Robert Moore), Prime Locations (owned by the Moore family), and Carmor PTY Limited (owned by the Australian firm, Hezlet Investments). A 2014 publication by the Oxford Business Group, suggests that the company specialises ‘in government business’. Like with Wildcat Developments, this raises the question of how the Prime Minister balances these potential conflicts of interest. Are they declared to the Ombudsman Commission? And is his personal stake in the venture made transparent before public contracts are awarded? From a commercial perspective, the company has proven a highly profitable investment for Peter O’Neill. Financial Statements submitted to the Investment Promotion Authority by its Australian Director and shareholder, Antoinette Amputch, indicate that over the years 2014 and 2015, 2 million kina was distributed as dividends to its shareholders (1,250,000 in 2015 and 750,000 in 2014). On 13 May 2016, both Peter O’Neill (via LBJ Investments Limited) and his accountant, Joseph Kup, sold their shares for an undisclosed amount of cash, to Iaraguma Limited. This is the same firm – owned by Sir Theophilus Constantinou – which purchased LBJ Investments Limited stake in Wild Cat Developments during 2016. Insurance Partners (PNG) Limited, Notice of change of shareholder registered with IPA on 26 November 2014, Investment Promotion Authority. Fairhaven No. 72 Limited, Company extract as of 7 March 2017, Investment promotion Authority. The company is also a shareholder in Aequs Oil & Gas Limited, NME International (PNG) Consulting Engineers & Projects Managers Limited and Pacific International Hospital Ltd.
 Janie Elizabeth Moore, Robert William Moore, Carmor Pty Ltd, Joan Elizabeth Moore, Robert William Moore. Prime Locations Pty Ltd, Current & Historical extract as of 17 January 2017, ASIC. Previously owned by Raymond E. Moore Pty Limited. Carmor Pty Ltd, Current & Historical Company Extract as of 17 January 2017, ASIC. Insurance Partners (PNG) Limited, Financial Statements for the year ended 31 December 2015, Investment Promotion Authority. Insurance Partners Limited, Notice of change of shareholder, 13 May 2016, Investment promotion Authority. Another valuable concern in O’Neill’s corporate stable is Resources & Investment Finance Limited, commonly known as RIFL. Its primary focus is commercial and consumer finance, for equipment such as motor vehicles, trucks, earth-moving machinery and mining and construction equipment; a useful asset in O’Neill’s business arsenal. According to the retired Supreme Court Judge, Tos Barnett, O’Neill acquired his stake in RIFL under dubious circumstances, a matter covered in greater detail during Part II of the Midas Touch. However, if this acquisition was a success, RIFL’s license was nonetheless withdrawn in 1999, and the business lay idle until Peter O’Neill became Prime Minister. In an interview with Business Advantage during 2013, current RIFL managing director, Australian national Brett Andrew, claimed ‘the licence then lay dormant for over 10 years before a revival was embarked upon, resulting in the successful application for a new licence by local PNG company Remington [owned by Peter O’Neill and Kenneth Harvey] and two other investors’ (italics added). Then, a sizable investment in RIFL was made by Peter O’Neill through his companies LBJ Investments, Remington Technology and Paddy’s Hotels and Apartments, which together injected over 18 million kina in 2014 and over 10 million kina during early 2015, out of a total of 32 million kina invested in the company over this period. It appears O’Neill investment is paying dividends. RIFL is a highly lucrative business, its 2015 financial statements show retained profits for this year alone of over 5.5 million kina. While the latest annual return shows assets worth over 70 million kina, with liabilities at 32 million. If we are to believe the findings of the National Provident Fund Commission of Inquiry, seeds germinated by the proceeds of the NPF tower fraud, have flowered into a blooming business for Peter O’Neill. Of course, it ought to be noted Peter O’Neill rejects the commission’s findings. Resources & Investment Finance Limited, Notice of issue of shares recorded with IPA on 20 February 2015, Investment Promotion Authority. Resources & Investment Finance Limited, Notice of issue of shares recorded with IPA on 14 March 2016, Investment Promotion Authority. Resources & Investment Finance Limited, Financial Report for the year ended 31 December 2015, Investment promotion Authority. Resources & Investment Finance Limited, Annual Return 2015, recorded with IPA on 20 June 2016, Investment Promotion Authority. The filing of annual returns with the Investment Promotion Authority appears to have been a troublesome task for Peter O’Neill and his private businesses, despite himself being a trained accountant. During the National Provident Fund inquiry, Peter O’Neill admitted his tardy administrative record, noting his company Pangia Enterprises Limited, was at the time ‘seven or eight years behind’ with its annual returns. Of course, the non-filing of required financial documents, and incomplete records, has been a perennial challenge for the Investment Promotion Authority. Recently the authority issued ‘an ultimatum’ to all defaulting companies – which are now publicly listed on the authority’s website. In addition, it has established a new automatic system to warn the troubled entities. Currently the number of companies in default is quite shocking and consequences of breaching the Companies Act by both directors and companies are serious where they can result in the companies getting de-registered or face severe penalties in fines. The relevant law is set out in the Company Act 1997. Section 215 states that Boards must ensure that annual returns are submitted at least once every calendar year, within 14 days of the annual meeting of a company. Failure to do so is an offence, exposing every director of the company to a fine of up to 10,000 kina under section 414 (2). (1) Every person who, with respect to a document required by or for the purposes of this Act – (a) makes, or authorizes the making of, a statement in it that is false or misleading in a material particular knowing it to be false or misleading; or (b) omits, or authorizes the omission from it of, any matter knowing that the omission makes the document false or misleading in a material particular, commits an offence, and is liable on conviction to the penalty set out in Section 413(4). Under this provision, those responsible may be fined up to K200,000 or imprisoned for a term not exceeding five years, or both. 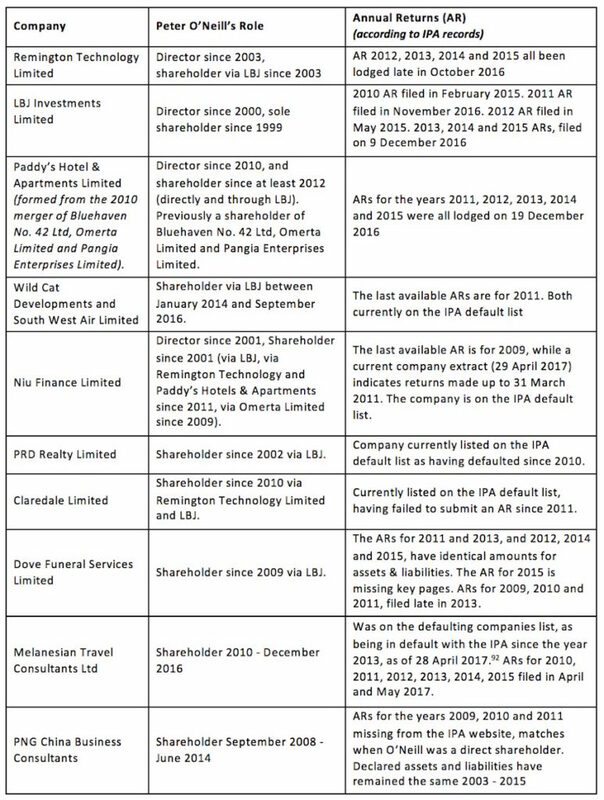 In the below table, a slew of examples are provided, which suggest O’Neill’s businesses are systematically breaching the Company Act 1997. An example of the irregular accounting practices encountered in some annual returns submitted by O’Neill connected firms, can be found with respect to Dove Funeral Services. As noted above, the annual returns for 2011 and 2013, and 2012, 2014 and 2015, have identical amounts for assets & liabilities. It appears highly unlikely the company’s assets for instance, went from 4,251,574 in 2011 up to 5,816,061 in 2012, only to then return to exactly 4,251,574 the following year, and then back up again to the exact amount of 5,816,061. If these statement of assets are false, then serious questions must be asked of those responsible for submitting these figures to the Investment Promotion Authority. Transcript of Proceedings of the Commission of Inquiry into the NPF, 29 November 2001, p56 of PDF. O’Neill is extremely wealthy, so what? There is little doubt that over the past twenty years, Peter O’Neill has fashioned himself into one of the most successful businessmen in the country. When questioned in the past, the Prime Minister has suggested business enterprise is simply another way in which he gives back to the community, through generating economic opportunities and jobs that sustain families. How altruistic O’Neill’s enterprises are is uncertain. It certainly appears he has personally benefited from these businesses to the tune of many millions of kina. Also, it is not clear how beneficial his business operations are for jobs, the economy, or Papua New Guinea families, if we consider the facts with rigour. Were we to believe the commissions of inquiry into the National Provident Fund and the Investment Corporation of Papua New Guinea, O’Neill was a key player in a network that decimated the investment arm of the national government, while allegedly rorting another major investment vehicle, the National Provident Fund. In so doing, it is reasonable to conclude, capital that could have been used to leverage broad based development goals of benefit to all Papua New Guineans, was subverted for the benefit of a small few. Peter O’Neill and his alleged conspirators, reject the findings of both commissions. Since 2000 O’Neill has overseen an expansive business empire that extends into nearly all sectors of the national economy. There is evidence to suggest that his companies have benefited from large contracts awarded by the national and Australian governments, in addition to development partners, primarily the Asian Development Bank. Furthermore, evidence outlined in this investigation, indicates O’Neill has used his office to patronise and support his private business interests. Whether he has done this systematically is unclear. However, the stakes at play are high. If market success in Papua New Guinea, has become inextricably married to political power, then the drives associated with competition and entrepreneurship, will find expression in business people more adept at covertly gaming the system through exploiting state power, to the detriment of the nation. In which case the capacity of public and private actors to achieve the National Goals and Directive Principles, becomes an impossible dream. Against this high-stakes backdrop, it is essential that Prime Minister O’Neill makes a full and transparent declaration of his commercial interests to the public of Papua New Guinea – as Prime Minister, he sets the standard for the nation. He should confront the findings presented here, and in previous iterations of the Midas Touch, showing the steps he has taken to ensure all his potential conflicts of interest have been managed in a way that would not harm the important office he has been entrusted with. Unfortunately, there is no arm of government that these findings may be referred to, which has the capacity, or resources, to seriously investigate the matters raised. The only agency of any major consequence at this moment in time is the people of Papua New Guinea, who have the power to demand their leaders and institutions conform in practice, to the same standard of honesty and integrity, that everyday people of this country display in their work and family life, a standard which is encapsulated no less in the highest law of this land, the Constitution of Papua New Guinea.